It is only common sense that there must be some approximate relationship between the size of a person’s hand and the size of a ball that will fit comfortably into that hand. But of course you can’t just walk into your local boules shop the way you can walk into your local shoe shop, and try on boules until you find the size that fits and feels best. So: what to do? 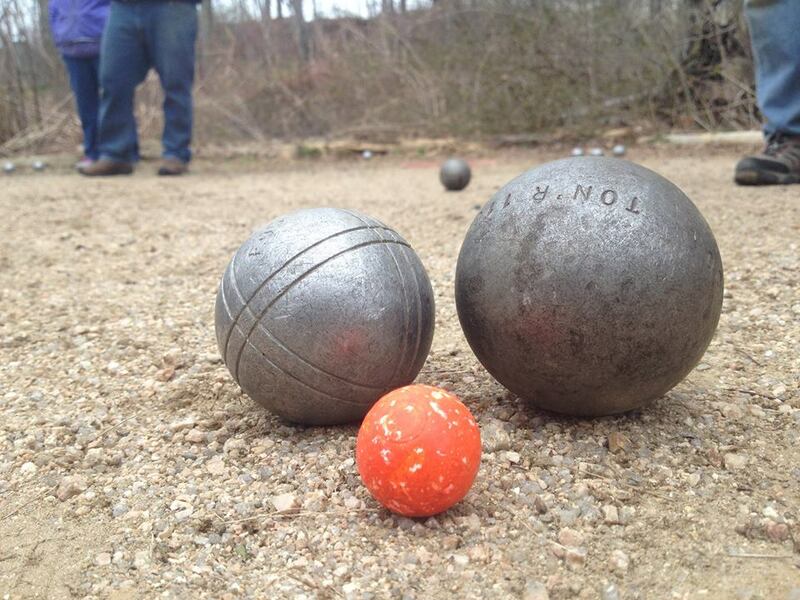 Since there are no boules shops in the USA, American players must order their boules from an online web-based vendor. That means that you must make your choice of boule size before you logon and place your order. And that means that you must measure your hand, and calculate your boule size based on your hand measurement. A number of methods have been devised for calculating boule size based on hand size. One proposed measurement of hand size is the distance between the tip of the thumb and the tip of the middle finger. Make sure you measure the same hand you use for throwing. This is what a right-handed player should see when measuring. 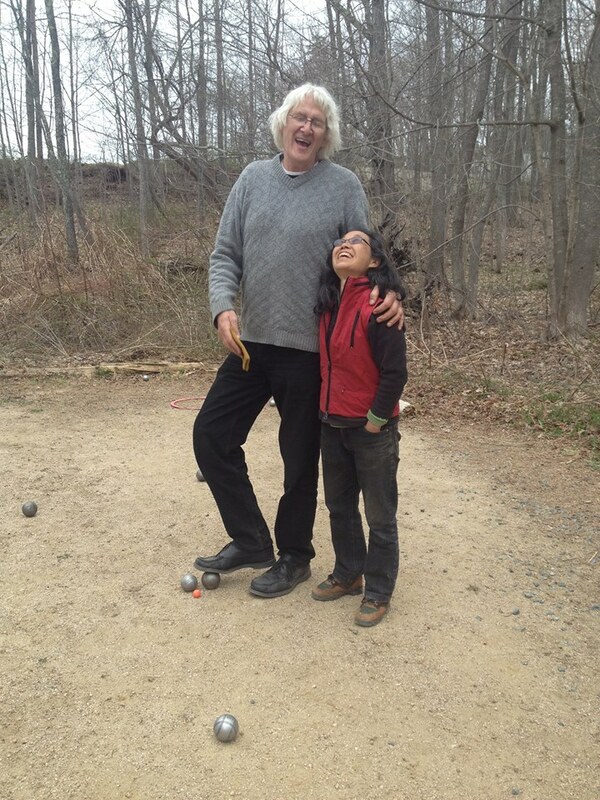 Here is the standard selection advice from the KTK “How to Choose your Petanque Boules” page. Here is Obut’s version of the same idea. Note that Obut’s recommendations run about 1mm smaller than KTK’s. OBUT, on their How to choose your boule page, bases their recommendations for boule size on the length of the middle finger. JB Petanque (once an Obut subsidiary) used to offer a gauge to guide you in selecting boule size based on finger length. 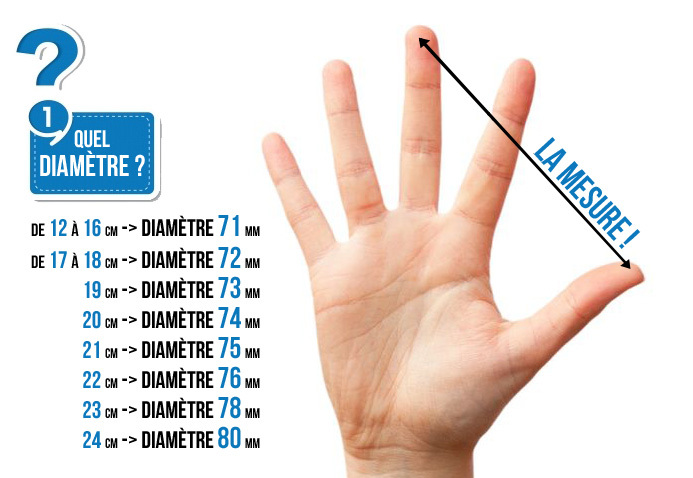 La Web de la Petanca, a Spanish web site, offers advice based on total hand length. Strangely enough, the picture shows a non-metric tape measure. Here is the French version, from the website of the French Petanque Federation. I am a fairly tall adult American male, so I would expect to need a slightly larger than average boule. I measured my hand using all of the above methods, and they all yielded similar results — a boule size of 76 mm. Still, I had my doubts. Measures of hand size were not precise. I could get different hand (and therefore, boule) sizes depending on how hard I tried to stretch out my hand. Many of the methods also take into account what type of player you are. The Obut web site, for example, recommended a boule size of 75mm or 76mm or 77mm depending on whether I considered myself to be a pointer, middleman, or shooter. This is confusing for a beginning player. It also calls into question the whole idea of hand size alone determining boule size. Nevertheless, I went ahead and ordered a set of 76mm boules. I played with them, but I kept feeling that they were too big. I felt like I had to grip REALLY tight to keep them in my hand. When I began trying to shoot, the feeling got worse. To shoot, you need a full backswing and a fair amount of speed. As my hand flew backward in my fast backswing, it felt like my boule might slip out of my hand. So I downsized first to 75mm, and then to 74mm. Favor smaller rather than larger sizes. When taking your hand measurements, extend your hand but don’t try to really stretch it out. If you need to round a measurement, round down rather than up. As a new player, select a boule size for a pointer rather than a middleman or a shooter. Over the past months, I’ve been experimenting to see which boule size fits me. I find a smaller size one helps me point. My best result was with a 70mm/690g (my hand size is 18mm, fingers short). But not so for shooting; I keep missing by a bit. That said, a small sized boule is ok for shooting if you hold is like Diego Rizzi’s – i.e. the “Crane School” of holding. I tried a 75mm (light one) and found my shooting improving tremendously. My petanque pals are egging me to get my own balls, but I am pretty torn as to which size to buy. It also means changing my way of shooting to a more traditional manner (like how most French top players do it). I’d probably choose a 74mm/680g as a compromise.